TCHS Pickering students pose with their DAR Good Citizen’s Award certification of recognition. Left to right: Pablo Gonzalez and Cassandra Tiburcio. PHOENIXVILLE — Two students from the Technical College High School (TCHS) Pickering Campus demonstrated that good citizenship always pays dividends. 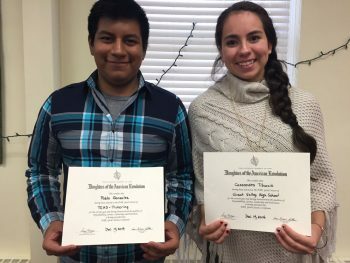 Full-time TCHS Pickering student Pablo Gonzalez received the Daughters of the American Revolution(DAR) Chester County Chapter’s Good Citizen’s Award for TCHS Pickering. Cassandra Tiburcio, a part-time TCHS Pickering student, also received the DAR Good Citizen’s Award for Great Valley High School. Both Pablo and Cassandra were recognized on December 14, 2016 at the Good Citizen’s Award Ceremony. The DAR Good Citizen’s Award is a competition in which regional schools can nominate a student whom they believe exemplifies the traits of a good citizen. The students then provide information about their high school activities, volunteer participation, and a description of how they have exhibited the DAR qualities of dependability, service, leadership and patriotism. In addition, the nominated students write an essay of approximately 500 words, in two hours or less, with no reference materials. This year’s essay topic was, “How do the combined actions of many good citizens keep our nation moving forward?” After the essay is completed, three judges read the essays and evaluate the students’ overall grades, activities and recommendations. A winner is then chosen from each of the competing schools to receive the award. For Tiburcio, her nomination came as a surprise. “I was humbled at the sound of the big news. At the ceremony, I got to meet the other students and many admirable women. I felt so honored to be a part of this prestigious group and I want to thank my family, teachers and friends for helping me become who I am today,” said Tiburcio. Both Gonzalez and Tiburcio had different focuses to their essays, which were influenced by the programs they are enrolled in at TCHS Pickering. Gonzalez, who is in the Criminal Justice & Police Sciences program, focused his essay on the impact that small actions can have on a local community. As someone who aspires to serve and protect his community, Gonzalez believes that small gestures from law enforcement can go a long way in helping to bring together communities and solve problems. Tiburcio, who is in the Teacher Leadership Academy program, wrote about her volunteer work as an English as a Second Language (ESL) instructor. For Tiburcio, being a good citizen means helping all people in the community gain the tools they need to be successful. The success of both Gonzalez and Tiburcio hasn’t gone unnoticed in their TCHS community. TCHS Pickering principal, Seth Schram, believes that both students exemplify why they were chosen for this award. “Pablo and Cassandra are both model students here at TCHS. I am so proud and thrilled that their accomplishments have been recognized. This is just one great example of the many positive things happening here at TCHS Pickering,” said Schram. For TCHS Pickering school counselor Lea Scott, this is just another validation of why she loves what she does. “I can’t tell you how proud I am of both Pablo and Cassandra. Seeing them at the recognition ceremony just made me so proud. Seeing my students succeed really inspires me and reminds me of why schools like TCHS Pickering are so important,” said Scott. This year, five schools participated in the local chapter competition. These schools included Delaware County Christian School, Great Valley High School, Overbrook School for the Blind, TCHS Pickering campus and Upper Merion Area High School. The five winning students’ entries have been submitted for scholarship consideration. A winner will then be chosen to represent the state of Pennsylvania. For more information about TCHS Pickering, please visit the school’s website at http://www.cciu.org/tchspickering.